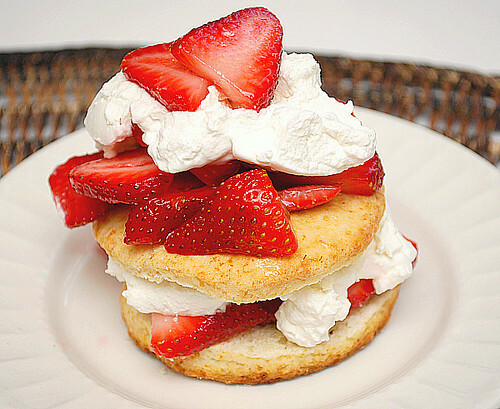 Strawberry Shortcakes are generally macerated strawberries and whipped cream paired with a sweet bread, be it a shortcake, scone, biscuit, etc. With the recent sale of strawberries lately, I've been stocking up on these berries to snack on and use in recipes. Why not make strawberry shortcakes too? 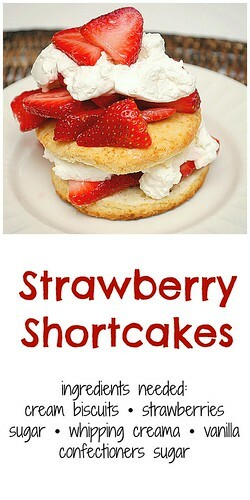 The following recipe is pretty easy to do and feel free to use any shortcake/scone/biscuit recipe you'd like. Rinse the strawberries and pat dry. Hull and slice the strawberries then place in a large bowl. Add the granulated sugar and toss. Cover with plastic wrap and chill for 30 minutes to 1 hour. Prepare the fresh whipped cream by placing the heavy whipping cream in a large bowl with the vanilla and confectioner's sugar. Using an electric hand mixer or your stand mixer fitted with the whisk attachment, whip the mixture until medium soft peaks form. To serve, plate the bottom half of one biscuit. Top with a tablespoon of macerated strawberries and a dollop of fresh whipped cream. Place the other half of the biscuit on top and add more strawberries and another dollop of fresh whipped cream. Simple Easy and Delicious. Love it!